It's been a busy year for controversial indie pop star Morrissey. Aside from some health woes and a public feud with Jimmy Kimmel, Moz also had David Bowie block the use of a photo for an upcoming reissue series. The image was originally shot in 1992 and featured the pair hamming it up for the camera. 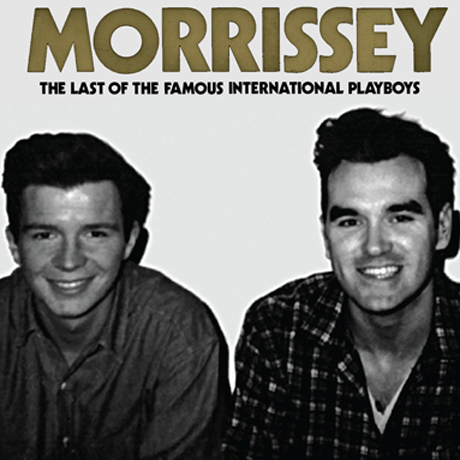 Morrissey was going to use it as the artwork for a repress of his 1989 single "The Last of the Famous International Playboys." It's unclear why Bowie blocked use of the photo, but Morrissey fansite True to You pointed out "although Bowie has no legal rights to the photograph, most of his back catalogue is presently licensed to EMI." Never one to give up (or, for that matter, let you down), Morrissey has decided to use a photo of himself with singer-songwriter Rick Astley for the release's cover. The new artwork is available above. For more information on the release, go here.